This full day tour visits the old town of Bari and the fairy tale town of Alberobello. After meeting your driver and licensed guide you drive to the old town of Bari. The industrialized port city of Bari was founded during the Bronze Age on a small promontory, which today, is the old town of Bari. Here you will find narrow alleys and breathtaking views of the sea. Bari grew and increased its economic importance after the Roman conquest and construction of the “Via Appia” road. Bari experienced a happy and rich period when ruled by the Normans. On May 9, 1087 the body of St. Nicholas was brought to Bari making it one of the three main places of Christianity during the time. The Norman Castle which is the largest building in the region is here. The castle was changed throughout history so you may recognize medieval and Renaissance additions. The Cathedral was built between the 12th and 13th centuries on what remained of a previous Byzantine cathedral. It is one of the largest Romanesque buildings in the Apulia region. The Cathedral is named for San Savino who is buried in the cathedral's crypt which is supported by 28 columns with Byzantine and Romanesque capitals. Beneath here the relics of St. Nicholas are housed. Following your Bari tour you visit the fairy tale town of Alberobello which has become well known for its curious whitewashed, round structures with gray, stone, cone-shaped roofs. These houses are called Trulli and are common in the region of Apulia but Alberobello is unique because it is an entire city of them. The word Trulli comes from the Latin turris, which means dome. The old town of Alberobello has about one hundred of these interesting buildings located on a hilltop surrounded by olive trees. While the exact origin of the circular buildings with stone teepee roofs is not known, it is said that the tradition is 5,000 years old. A common theory is that they were popular in the Middle Ages when house taxation was heavy. The buildings were temporary and could easily be moved to avoid being taxed. Today the buildings are permanent and a visit to the interior is a treat. The roof covers a common area which is separated by colorful curtains which pose a sharp contrast to the stark white walls. Simple furniture made from olive wood is the work of local farmers who have lived in these buildings for generations. The buildings stay cool in the hot summer because of the stone walls and in winter they rely on the hearth for heat. 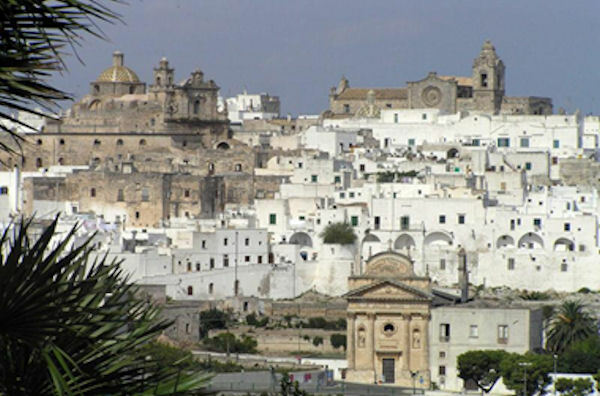 In 1996 the town of Alberobello was added to the UNESCO list of heritage sites. While you are in Alberobello you enjoy free time for lunch on your own. Remember to bring your camera. Free time will be given in Alberobello for lunch on your own. Please note: This tour is not suitable for our guests traveling with a wheelchair. This tour requires extended periods of walking over difficult terrain. Tour length might vary to fit ship’s scheduled departure time. Your ship must be in port at least 7 hours for this tour to be confirmed.